Cosmetology school is just the beginning of a service-oriented career. The hair industry attracts a gamut of personalities. Self-discipline, a necessary trait, will prepare each stylist anxiously awaiting his or her incredible journey of the art of styling hair. Upon passing the state tests, and receiving the required license via mail, seeking a geographically desirable salon is the next step. If finances are an issue, a commission salon is a wise choice. 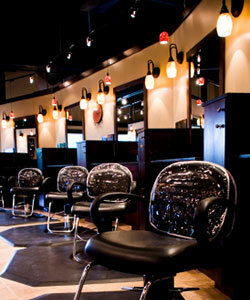 Advantages of a commission salon are no payment of lease and no financial overhead of products. Mandated work hours by the owner will enforce self-discipline and positive work ethics. Beginning a career in a lease salon, each individual lessee must express personal dedication. There is not a salon in Texas waiting to hand an emerging stylist a full cliental. Veteran stylists proclaim, You gotta do the time of sitting, waiting, and interacting within the salon. This behavior will set the concrete foundation in building a career and financial stability. Continuing education hours are required by the Texas Department of Licensing and Regulation. Beyond the number of continuing education hours, a stylist continually attending classes, hair shows and workshops will attain a definite advantage in this ever-changing industry. Salon cliental is drawn into the service aspect of the salon. Customers rely upon individual stylist to stay up to date on the latest cutting technique or miracle product on the market. Educational events will act as an energy boost for the stylist. With feet firmly planted and cliental building, the focus becomes the hunt and a reputable manufacturer and their retail products. Every manufacturer has an education team. Stepping into a hair show is the first taste a stylist will encounter when needing to expand their revenue. Seek a manufacturer that represents the industry and has an extensive history and thriving business. Directly involve yourself with that manufacturer and their educational opportunities. Educating for a manufacturer entails teaching, demonstrating, and traveling. Dedication of ones career towards one manufacturer could extend a stylist to the international hair show venue. Product knowledge and confidence will ensure retail selling in a salon and generate dollar sales. Continual education will enhance the stylist ability in cutting, coloring, and styling hair. Generally, the public will not recognize the correct product for his/her hair type. Guaranteeing stylist recommended products will produce to lifelong client. Concentrating on basic demands of everyday life, salon clients depend on their stylist to lessen their load when deciding on purchasing hair products. Pampering a client is a must in the world of hair. Qualities of an excellent stylist include: patience in building cliental, product knowledge, and amazing ability of staying two steps ahead of the fashion industry. Being a self-employed independent stylist requires self-motivation and discipline. The world of cosmetology contains endless avenues of success and financial security. Ones heart and soul must pour into the cup of which will overflow. Do you have what it takes to be a successful licensed cosmetologist in the state of Texas? Jeina Dunn is a licensed massage therapist, dedicated more than twenty years in the distributor level through owning an Armstrong-McCall professional beauty supply in Weatherford, Texas.